Will Graham (William Petersen) is persuaded to return from retirement by his colleague Jack Crawford, who convinces him that his ability to understand the thoughts of a murderer can help them to capture elusive serial killer, 'The Tooth-Fairy'. Facing the desperate and grisly task, Graham employs the help of old foe Hannibal Lecktor and thus puts himself at the mercy of a ruthless and sinister genius. But as Graham opens himself up to the mind of a killer, just how far is he willing to fall back into the old life he promised his family that he had left far behind...? Adapted from the novel Red Dragon by Thomas Harris, this was the first film to feature one of modern cinema's most iconic characters, Hannibal Lecter (actually Lecktor here), terrifyingly played by Brian Cox. Directed by Michael Mann (yep, the one behind Heat and Collateral), it easily eclipses the later remake, Red Dragon and remains one of Mann's most compelling films. 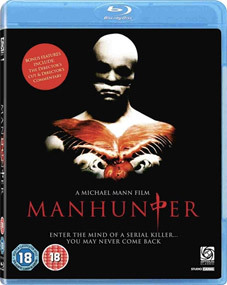 Now Manhunter comes to UK Blu-ray from Optimum Home Entertainment on a disc that contains both the original theatrical cut and the more recent director's cut. The disc will be released on 26th September 2011 at the RRP of of £19.99. Word has it that there will also be a commentary on the Director's Cut, but this has not been confirmed.